I.Note:The pump may work intermittently or stop from running under the following situations. 1.The day is cloudy or overcast . 2.It is partly covered by a shadow of a tree branch. II.If your birdbath/pond/Bowl is too small ,and you don't want to refill the water often. ★Anchor it in the centre of birdbath to keep it from floating to the edge and emptying all the water. 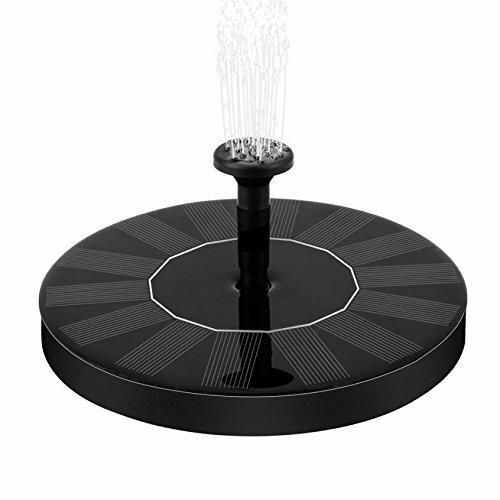 ✔If your birdbaths are made of glass or metal, use the three suction cups on the bottom of the fountain. ✔If yours dose not have smooth surface,you can put pebbles/small rocks around the edges to secure the pump to the base of the bird bath. ★ Use the base fitting of this fountain pump without any of the spray attachment.it still create beautiful bubbling effect that birds enjoy. 2.Remove the plastic protective film on the surface of the panel. 3.Choose the spray attachments depending on your preference. 4.The fountain immediately turns it on once the direct sun hits the top surface of the pump. SOLAR POWERED:With highly efficient solar panel ,this solar fountain pump has excellent capacity of solar power collection,making it a energy saving and environment friendly choice.it works perfectly in full,direct and constant sunlight.Please place your fountain in an area that can get good sun exposure with no shades or shadows.It starts automatically and fast after 3 seconds in bright sunlight and delivers a nice tall, continuous and steady flow of water. NOZZLE ATTACHMENTS FOR DIFFERENT EFFECTS:This solar power pump comes with several different types of spray heads for different spray height and pattern. The height of the spray depends on the amount and intensity of sunlight.In full sun, the maximum height of the spray is 80cm/27.5inch. You can choose the nozzle tip according to to the size of your birdbath/ponds. SUBMERSIBLE AND FLOATING WATER PUMP:You can make it floating around your ponds or pools and spraying some water out on the ground. It also allows you to use the suction cups on the bottom of the pump to stabilize it on the centre of birdbath. The integrated solar panel captures sufficient sunlight to drive the tiny pump even when it is submerged in water. SAFE AND EASY INSTALLATION&MAINTENANCE: No extra screws and no plugs is needed.No electric outlet or battery is needed,so it is easy and safe to to assemble and use this water pump. It needs a little maintenance regularly, but it is very simple to disassembled the unit and clean the debris off the pump intake filter. MULTIPE APPLICATION: It helps you to attract birds who enjoys the water movement in the bird bath fountain where they can have a bath, cool themselves and getting a drink from it in hot summer. It is a must buy to decorate your garden,patio,yard,backyard,fish tank,small pond, pool,etc. It is also ideal for oxygen aeration and water circulation to keep the mosquitoes/insects from breeding. If you have any questions about this product by V-Best, contact us by completing and submitting the form below. If you are looking for a specif part number, please include it with your message.